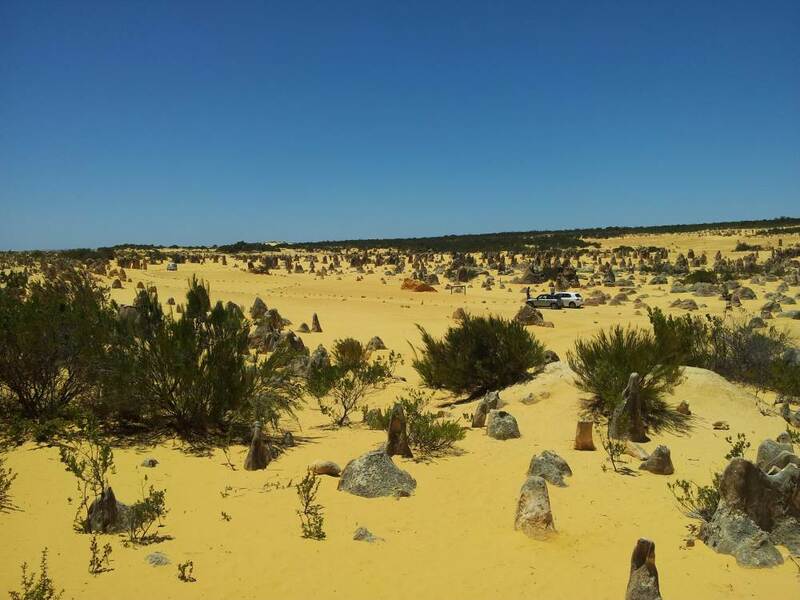 Cervantes 202km & The Pinnacles 194km Nearest Fuel: Cervantes. There are plenty of coastal 4WD tracks north from Cervantes to Dongara (see Jurien Bay for a great 4WD track). 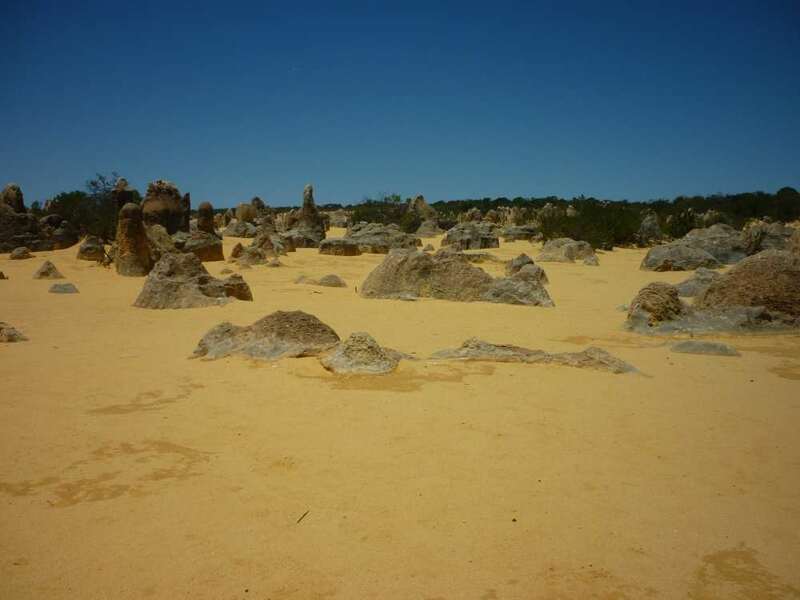 Combine with: Jurien Bay, Green Head, Leeman and Stockyard Gully Caves. Cervantes is a small fishing town about 2 hours drive from Perth. This small town thrives on tourists and fishing. Many of the tourists pass through Cervantes after visiting the Pinnacles and others drop in for the beautiful beaches and coast line this region has to offer. On a week day it is usually very quiet in town, however on a weekend it gets busy and in the holidays the population is said to double. See also Accommodation Near The National Park. The fishing town was named after an American whaling ship, called Cervantes, caught in gale force winds in June 29 1844 and wrecked just off the coast. The wreck was later found in 1969 lying in shallow waters near Thirsty Point. The first fishing shacks were built in the 1950's, the main focus was crayfishing. Today there are over 50 rock lobster fishing boats operating from the bay during the season from November to June and about 600 tonnes of rock lobsters are landed during the season. A car park with access to the beach, which is very popular with wind surfers and kite surfers. This lake is worth checking out for its Stromatolites, it's one of the only lakes in the world with living marine stromatolites. 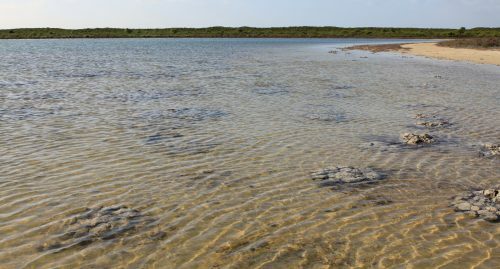 There is a large car park and a long board walk out to the middle of the lake, here you will find a viewing platform where you can get close to the Stromatolites. Stromatolites are formed in shallow water from microorganisms, to get the full scientific explanation you will just have to visit the lake yourself, there are boards at the viewing platform explaining the whole process. A look at Cervantes from Hanson Bay lookout. From this look out the entire town of Cervantes is visible and looking east is Lake Thetis. 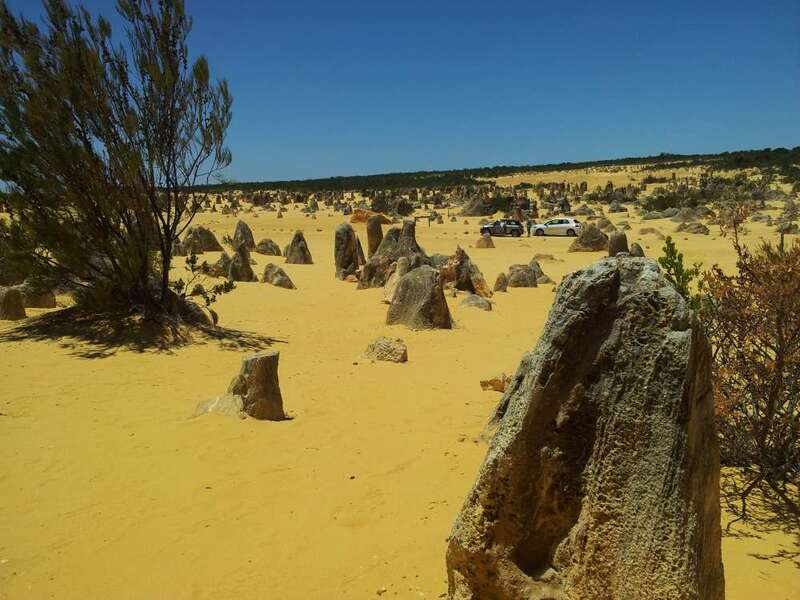 One of the most unique places you will see within 300km from Perth, placed in The Nambung National Park, has got to be The Pinnacles, a yellowish sandy desert with tall limestone scattered everywhere, they kind of look like honey comb tree stumps. It's quite a bizarre sight and is worth a visit more than once for sure. Going for a walk at The Nambung National Park. To conserve the area there is a track that snakes around and laps back at the entry point, there is a spot to park almost every 50m, make sure you stick to the track. If you drive off the clearly marked track into the desert you will be fined and will have to sweep the desert with a broom!! (Yes I have actually seen this happen once), this is done to erase your tracks as others might follow them. You can drive around as many times as you like, however it's better to park the vehicle and get up close (you are allowed to walk anywhere within the desert, even up and over the hills). 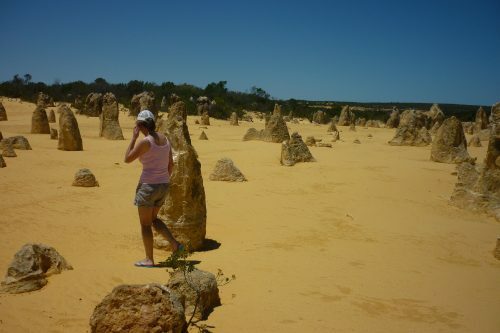 The Nambung National Park covers an area of 17,491 hectares and The Pinnacle desert just over 400 hectares so even on a busy day you can still manage to get photos with no people in the shot. 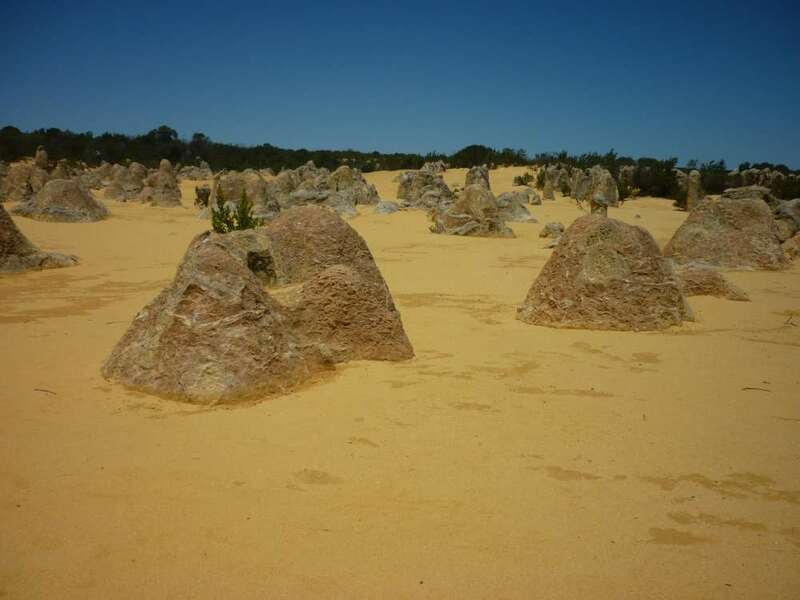 The area is covered with thousands of limestone Pinnacles some up to 4 meters high. It's all accessible by 2WD Road base or gravel tracks with some corrugations. Sunscreen, bush hat, plenty of water & Camera. Leave The Pinnacles And Go To Homepage.